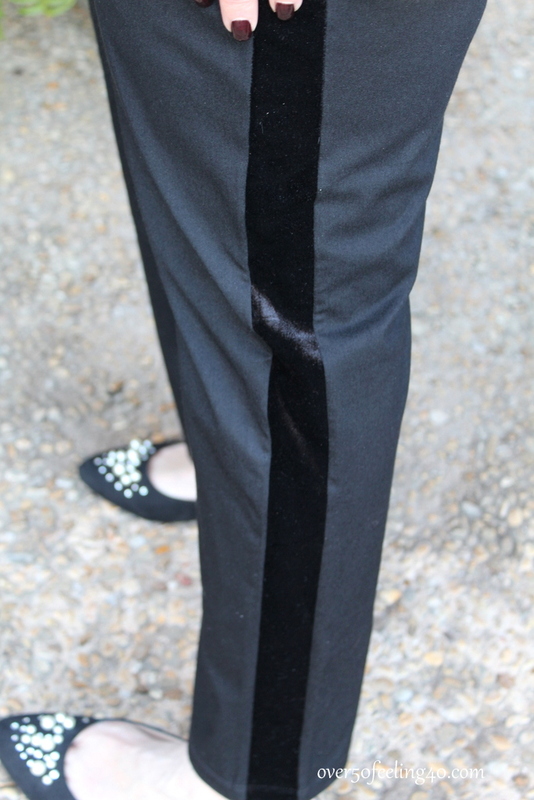 This week I will be styling a pair of Chico’s tuxedo pants, with a velvet stripe. There are many versions of tuxedo pants on the market, and they can be very slimming, so I wanted to encourage you to give them a try. But, first let’s discuss “confident style.” I believe a woman has achieved a confident style when she can look in the mirror and say…”Oh yeah, this is me, look out world here I come!” I also check every outfit I wear to see if it meets my the adjectives I have chosen that I wish to communicate with my style. 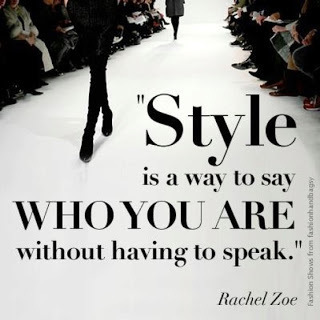 We each have our own style and style adjectives. What we wear communicates something about us …whether we want it to or not.  After going through a personal reinvention at age 50 (15 years ago), I have developed a confident style for me. I write a blog to hopefully inspire other women to do the same for themselves. Many of you have asked me to continue these posts of “different ways to style one piece”, and some have said the posts help with ideas of what do with your own wardrobe. That is exactly what I hope for. However, these posts have also generated criticism of me like I have not received in some time. I have been accused of wearing white socks (it’s my skin, ladies…I am white! ); I have been called boring; I have been criticized for my choices of clothing with my size of body. Just remember, I do this to help you with your own personal style. To generate tips and ideas…not because I want the readers to be clones of me; but in order, to spark creativity and confident style for all of us. You may criticize me if you like, but please know, I am confident with who I am and how I dress. And I want the same for each of you. Now that we have established the purpose of these posts, let’s look at today’s tuxedo pant in Look #1. A tuxedo pant is menswear, and I wanted to begin with a traditional menswear look. 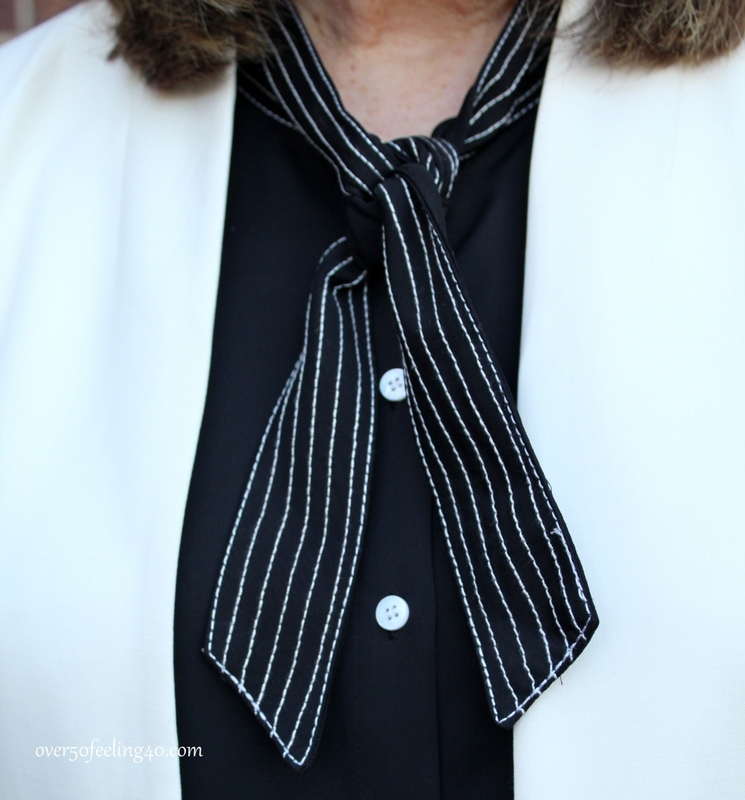 However, instead of a shirt and tie, I wore this lovely Vince Camuto blouse with a B & W tie. 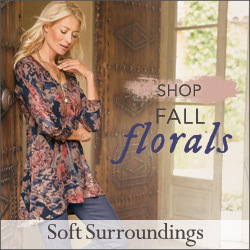 The white buttons going down the front of the shirt take the eyeline on a path that is slimming. I also wore my pearl-embellished pointed-toe flats for more elongation…so the slimming techniques are the buttons, the stripe on the pant, and the shoes. These pants were on sale after Christmas at Chico’s, and there are many versions on the market. I believe we will see them into warmer weather as well, though, of course, not in velvet. I found a few for the slideshow below….along with some selections from the Talbot’s Red Hangar Sale which ends today. Thank you so much for being here and for allowing me to do some further explanation about the purpose of these posts. My wish for all of us is that we walk out wearing our own, individual confident style!! 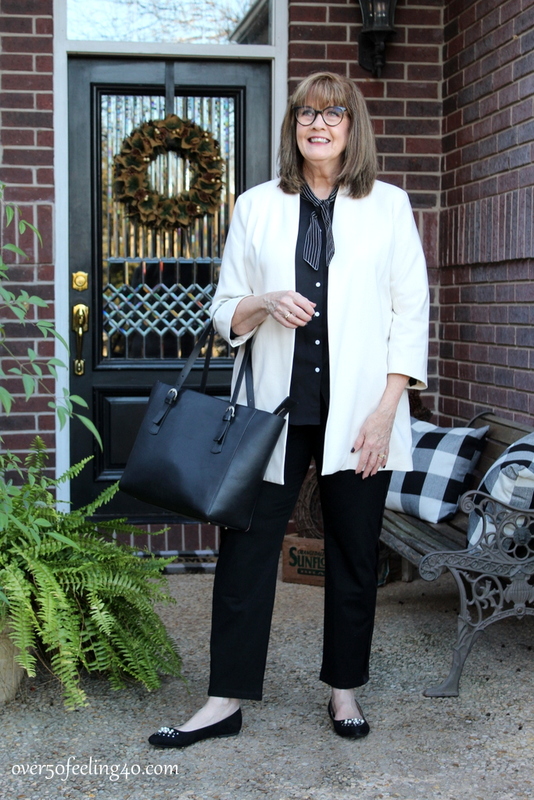 Do you own a tuxedo pant? If so, what are some ways you style them? See you tomorrow with Look #2! KEEP SMILING AND GO OUT WITH CONFIDENCE!! Pam , don’t feel bad when people criticize you. They do it to make themselves feel good. I enjoy your blog very much. I always enjoy reading your blog. I love your style! Your tips and ideas are very helpful. Thank you for sharing them with us! Whoever is criticizing you is mean and petty. You always look beautiful and I enjoy reading your blog. I like this look very much, except for the stripe on the pants. Every blogger and you tuber I follow (not very many, but still …) sooner or later will discuss the deliberately cruel and unproductive comments they receive. This is a form of adult bullying … ganging up on someone because they are jealous that they have a following and respect, or because the anonymity of the internet allows them the freedom to make others feel small. In addition, not you, Pam, but some others have so much gifted fashion and makeup that I think it makes everyone else seem poor or lacking. If that person already feels stressed financially or angry about the unfairness of life (and life can be very unfair), they lash out. In other words, it has nothing to do with the blogger and everything to do with the bully. That said, the people who bring us content are human beings, and you can only hit a delete button so long before one of those comments really, really stings. Hugs to you and thank you for bringing us this site. I enjoy it a lot after a long day. Can’t count how many times I have found inspiration from you. Thank you!! Lord ha’ mercy, didn’t these trolls have a mother to teach them right from wrong? Pam, you keep doing what you are doing. We all learn from your posts and are inspired to take ideas from the outfits and make them our own. There are somethings that are on trend right now that I wouldn’t wear but to each, her own. I never comment on the few blogs I follow, but felt compelled to do so today. Even though your look is not really for me, it is fantastic for you and many others. You always look great! I follow you because I admire the beauty of your character. Through your blog I have followed links to other sites which have taken me down a path to self-reflection and personal development (I matter). I really enjoy your blog & am always interested to see what you’re wearing. In my opinion, you always look very polished & put together. Some of your clothing choices would not be flattering on me, but it still gives me ideas on how to pull pieces together. So I always appreciate what you’re sharing! Pam I really enjoy the new ideas you bring ladies in our age group. I have tried some of the products (Charmonix) and styling looks (Chico accessories) you have recommended and been very pleased with results. You help me to think outside my usual. I read your blog every day and am impressed with your dedication. It’s obvious you care about every woman you reach. You encourage all of us to put our best selves forward not just with clothing but with a positive attitude. Thank you for your message! I have never had tuxedo pants, but do like how you styled them here. I see how the stripe can make them slimming, almost in the way color-blocking works. How unfortunate that there are some women going out of their way to search for something negative to say. I saw the “boring” comment and was stunned. I hope you realize just how many of us love reading your posts, and that we look to you for inspiration and ideas. I’m sure we far outweigh the negative voices. I do think it’s important to acknowledge those negative people though. It gives the vast majority of us another reason to thank you for all that you do! Ignore the naysayers who are generally unhappy people who need to criticize others to make themselves feel better. Feeling good about yourself comes from within you…and the way you, Pam, present yourself shows you do. Keep it up. Ignore ’em. Your blog is one of my favorites. Now, the pants…I have never been a fan of the stripe down the side thing. I wish I could tell you why, specifically, but I just don’t like the look. I am that way with some other things, too (cable knits, etc.) Since feeling good about what we wear is the goal, then there’s no reason to wear a thing just because it’s in style if you don’t really like it. You do you and I’ll do me. LOL. Unfortunately, many use the relative anonymity of blogs & social media to be rude & mean spirited. That is their problem not yours. Your style may not always be appropriate for me, as we are different body types, but it often makes me think about similar items I have in my wardrobe in a different light. I have also stepped outside my comfort zone to try something different things. Sometimes, it has worked. Other times, it hasn’t, but at least, I have tried. Keep up the good work, & as you remind us, keep smiling. Pamela, this classy/professional/put-together look is very flattering..really like it! And thank you for expressing yourself in both word & deed…love that authenticity. I have never comment however I enjoy following your blog and the new ideas you share. This inspires me to look in my closet for ideas. I have never understood the nay sayer’s obviously the never heard the saying “If you can’t say something nice don’t say anything at all”. Keep blogging I look forward to your posts. 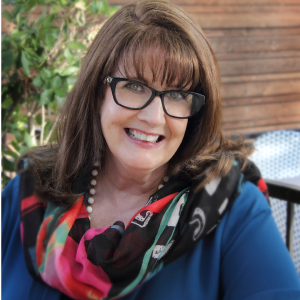 Thank you, Pam, for putting yourself out there over and over in order to help and encourage us “women of a certain age”! It’s obvious to me that you are a woman of faith, class and style. You are always an encouragement to me personally – I love seeing bits and pieces of your life as well as your suggestions and ideas for fashion, health, and living. It is a sad fact of life these days that folks feel it’s okay to make rude and mean comments from the safety of their computer, tablet or smart phone. Unhappy people make themselves feel better when they are trying to tear down someone else. As one Southern Lady to another, you know exactly what I mean when I say – “Bless.Their.Hearts.”! Keep up the good work and know you are loved! Please ignore the negative people. You have a lot of us who follow you and enjoy your blog. I find you to be one of the most down to earth bloggers that I follow. Your posts are very informative and I think easy for us to take some suggestions. I do love the tuxedo pants but do not own any. I did see a casual pant with a stripe down the sides which I am thinking about ordering. Thanks for your blog posts. As always your blog is a breath of fresh air. I love all of your fresh ideas. I always enjoy reading and seeing your blog. I started back when you were taking pictures and posting them of Gigi and yourself at work. You are a lovely woman who wants to share ideas about women and life. Thank you for your blog.